On Saturday June 4th 2016 and as part of Roman Chichester Week and in collaboration with the Novium Museum, Chris. 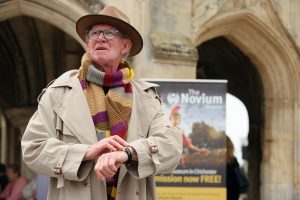 travelled back in time and brought the story of Roman Chichester to life at Chichester Market Cross – lifted it off the page ! The story began with Chris. as Doctor Who and then with the help of the Tardis, took the audience back to 43 A.D.
Chris. – as Chris. 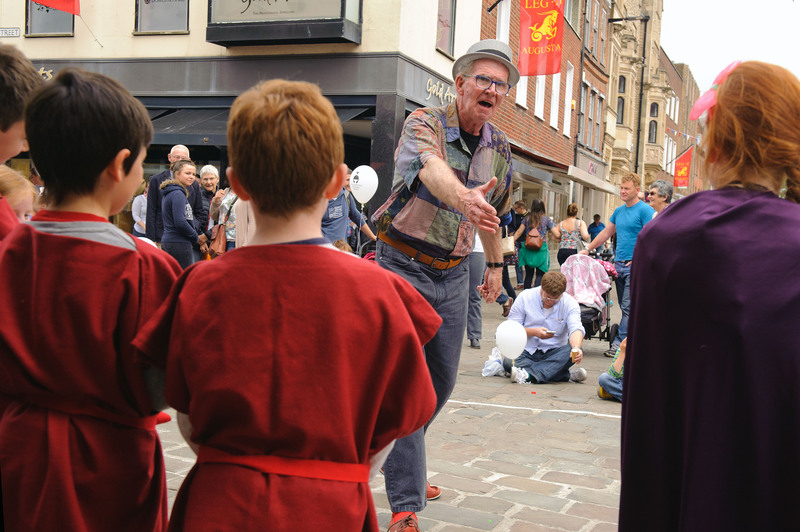 – enthusiastically encouraged audience members to take part in bringing the story to life. 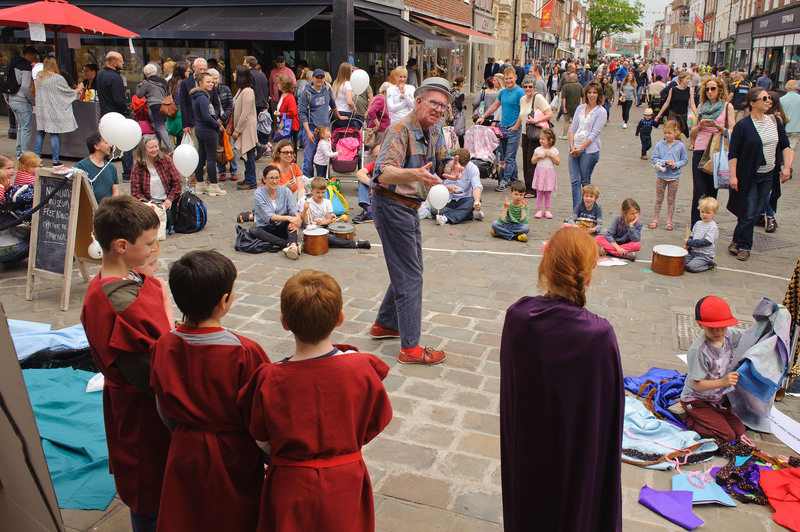 Some children wore various costumes and became Roman Soldiers, others Celts and by using fabrics, drums, tissue paper told together the story from the invasion of Britannia to the building of Noviomagnus – Roman Chichester. 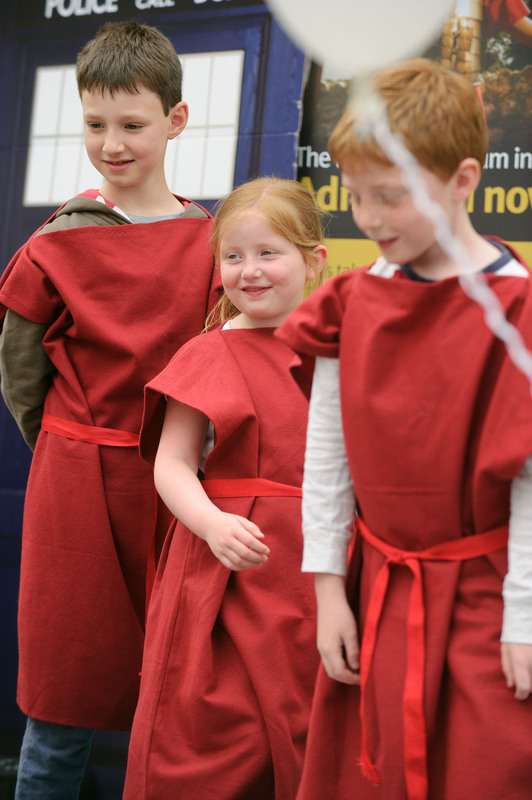 The children marched, travelled across the ‘sea’ ( a long length of blue material ) before meeting the Celtic King Togidubnus. Chris painted an interactive picture of the amazing story of Roman Chichester, which was received with warm enthusiasm by the crowds who had gathered. Chris invited everyone to go to the Novium Museum and see for themselves part of the legacy left behind by the Romans almost 2000 years ago. On Wednesday June 1st. 2016, Chris. provided a similar drama experience in The Novium Museum itself.